Blog›How to use Call-to-Actions effectively? How to use Call-to-Actions effectively? Call-to-Actions are used to get the most out of digital marketing by making the receiver perform some desired action. In the digital marketing context, they are usually referred to as Call-to-Action buttons (CTA). CTA's don't always need to be precisely buttons but the idea is the same. Call-to-Action (CTA) is used to make your receiver perform a desired action. Often it is a button meant to be clicked by the person at the other end (whether it is someone reading your newsletter, browsing through your landing page or searching for a product in your online store, for example). The button is usually designed so that it is clearly visible and it often has a "teaser text". Where will you be placing your Call-to-Action? Whether a newsletter, an ad, a landing page or an online store, the CTA might have different requirements. How will you make it pop out in a newsletter, for example? And how will it look like in an online store packed with loads of other information surrounding it? Always design your Call-to-Action specifically for the context you use. Neil Patel encourages website visitors to leave their digital footprints (image source). Make sure your Call-to-Action is optimized for different end devices, whether a smart phone, tablet or desktop. If it's a newsletter, make it a responsive newsletter so your Call-to-Action will be the appropriate size on mobile devices. If it's a website, use responsive design. Think about the following: what is the primary goal you want to achieve in this particular context, with this particular CTA? Your Call-to-Action might look very different and say different things depending on the goal. 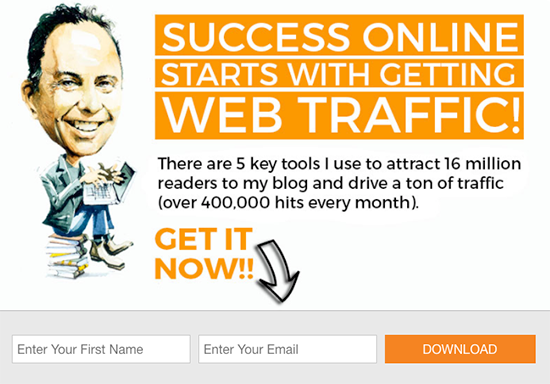 Jeff Bullas uses incentives to collect email subscribers (image source). Today's technology offers many kinds of opportunities for marketing automations and triggered communication. With the help of technology, you could have different Call-to-Actions depending on where the person came from and what he or she did before arriving to your CTA. Short and precise is better than complicated in the actual button. Your wording in the actual button could be very short, actionable and precise. But what does the path of getting there look like? Is it tempting enough to make your target audience perform your Call-to-Action? ...but not to the point of irritation. No need to put on flashing lights or ten exclamation marks. But we recommend you pay close attention to the colours and design as well as the surroundings of your button. Does it pop out enough or are there too many distractions elsewhere on the site? 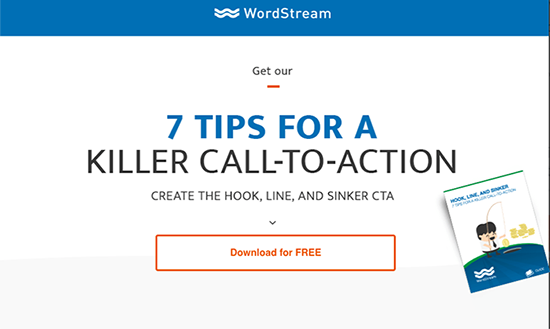 WordStream has visually clear CTA's (image source). Here we are talking about digital marketing and its channels in the bigger picture. For instance, if you utilize CTA's in your newsletter, is your website up-to-date and functional? In an online store it is vital that the purchase process flows on effortlessly. A good CTA doesn't save anything if some other parts are lacking. Is every step of your process working out fluently? A well-made Call-to-Action won't help if other technical issues (or other kinds of inconsistencies) come up along the way. Also, make sure the technique behind your digital marketing efforts is functioning properly. Liana Technologies offers a wide range of digital marketing solutions that are both user-friendly and technically fine-tuned.